Saint Leo University appears in our ranking of The Top 15 Best Affordable Online Master’s in Accounting Degree Programs. The accounting and finance degree programs offered at Saint Leo University prepare students to excel in their new careers in a multitude of industries around the globe. Students can expect to work at large multinational corporations, start-ups, museums, or virtually anywhere an individual feels is a good fit. There are literally hundreds of thousands of opportunities in the United States alone for individuals well-educated in accounting and finance, and for good reason: accountants are a necessary proponent of any business. Accountants and financial specialists help businesses manage and grow their money. At Saint Leo, students receive one-on-one instruction with faculty members that are more like mentors and friends than ‘teachers’, who are dedicated to helping their students succeed not only at the university but also out in the ‘real world’. Saint Leo University offers a Bachelor of Arts degree in Accounting and two master’s degree programs in accounting and finance, all offered online. All of their accounting degree programs include courses such as intermediate accounting, cost accounting, financial statement analysis, auditing, and accounting information systems. Students who have completed these degree programs at Saint Leo University now hold positions around the country as CPAs, IRS investigators, Forensic Accountants, Chief Financial Officers, Controllers, and Consultants. The median salary of accountants throughout the country is $69,350 a year according to the Bureau of Labor Statistics, and jobs are being created in the industry at a rate of about 10% through the next ten years. Perhaps most importantly, Saint Leo University gives its students an education in social responsibility, morality, and kindness toward one another and consistently produces graduating class after graduating class of upstanding citizens. In today’s world, some might say that the lessons outside of curriculum at Saint Leo University are far more paramount than the lessons in the classrooms. Located roughly 35 miles north of Tampa, Florida, Saint Leo University is Florida’s first Roman Catholic University, but has always offered a quality education for anyone capable and interested in learning regardless of personal faith. Owing to its rich Benedictine history and tradition, the university has a professional mission rooted in the balanced growth of students’ minds, bodies, and spirits. Saint Leo University teaches students how to succeed in every area of life – at its education centers, on campus, and through the Center for Online Learning. Their model for life success is based on Christian ideals; primarily those that recognize the value and God-given gifts of all people. Students at Saint Leo University are encouraged and expected to fully explore and articulate their personal values, but also listen respectfully to the opinions of their classmates and professors. Students are also expected to serve the community and care for all of God’s people. Saint Leo University is one of the largest Roman Catholic colleges in the country. In addition to those students who study on the university’s main campus, Saint Leo University also has students at more than forty education centers around the region, as well as their ‘Center for Online Learning’, though which they offer distance learning to students around the world. In fact, Saint Leo University has a presence in all 50 states, D.C., and more than eighty countries around the world. More than sixteen thousand students are receiving a high quality education from this university. Today, Saint Leo University is one of the top providers of higher learning for active-duty military members and veterans. More than 40 associate, baccalaureate, and master’s degrees can be earned at Saint Leo University – on campus or abroad. In addition to being accredited by the Southern Association of Colleges and Schools Commission on Colleges (SACSCOC), many of its individual degree programs hold additional accreditation. 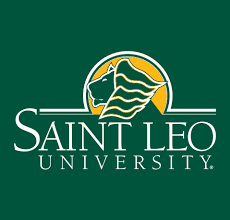 Saint Leo University is a member of the American Association of Adult and Continuing Education, the Association of Catholic Colleges and Universities, the National Association of Institutions for Military Education Services (NAIMES), and many others. Applying to Saint Leo University is a fairly easy process. Incoming students are evaluated on a rolling basis and students simply have to fill out an online common application after August 1. Students should submit their official high school transcripts in a sealed envelope, a completed high school transcript release authorization form, a letter of recommendation, and SAT or ACT scores to the office of Admissions. Students are also encouraged to submit their Federal Application for Student Financial Aid (FASFA) as soon as they receive their letter of acceptance. Currently, the cost of tuition at Saint Leo University is $38,492 per year. Freshman scholarships, a presidential award, the Dean’s Award, the Excellence Award, the University Award, and the Campus Award are all available to incoming freshman and each are valued at well over $10,000. For transfer students, Transfer scholarships, the Presidential Transfer Award, the Dean’s Transfer Award, the Excellence Transfer Award, the University Transfer Award, the Study Florida Transfer Scholarship, and a 50% Tuition Discount for all students who have completed an Associate’s Degree with at least a 2.0 grade point average from the Florida College System are all available. All of the scholarships and awards are automatically renewable every semester until graduation. Between one-on-one instruction with dedicated faculty and a wealth of internship opportunities from Saint Leo University’s long-established connections in the community, it isn’t hard to understand why over sixteen thousand students have chosen Saint Leo University to be their educational home.